By Terry is a wonderful product developed by Terry Gunzburg. I have quite a few products from her line and really enjoy using all of them. They are on the expensive side, but you get what you pay for – quality in products that really deliver. I bought the aqualip as I was on a mission for true “stain” for the lips. It was part of their Aquachic collection and it came in only one colour- Dancefloor Flirt. It is described as a “temporary tatoo” delivered in a water-gel formula. It is infused with botanical glycerin which boosts hydration. The product in the tube looks frightfully orange, but once applied with the doe-foot applicator the colour is a definite hot pink. The texture is waterlike and immediatly adheres to the lips. This is a perfect stain. The product dries down to a strong yet wearable pink. This product is perfect for hot weather as it does not budge. I must advise that lips should be prepped beforehand. Use a good lip exfoliater (I recommend Sara Happ Lip Scrub reviewed here.) About 20min prior to application use a regular lipbalm like Fresh Sugar Advanced Therapy. This will hopefully ensure smooth application with no patchy area’s. The Jelly Tint can be applied once for a sheer look or multiple time for a bright pop of pink. 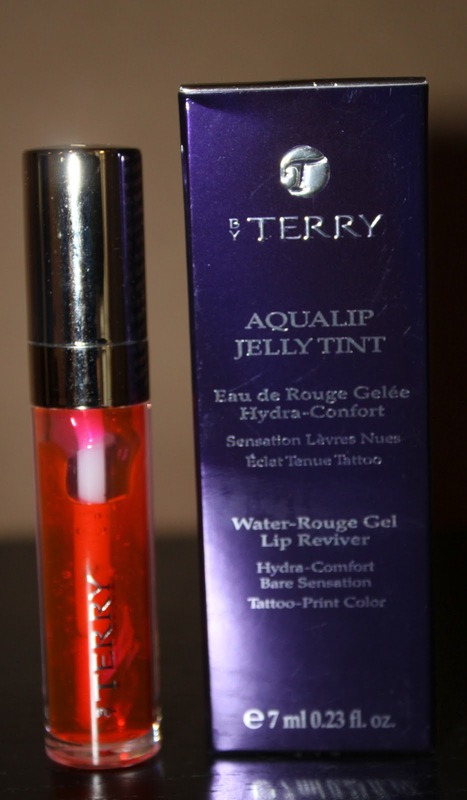 My only request is that By Terry keeps this limited product in their regular lineup and introduces new colours.